Jet black granite with sculptured angel. 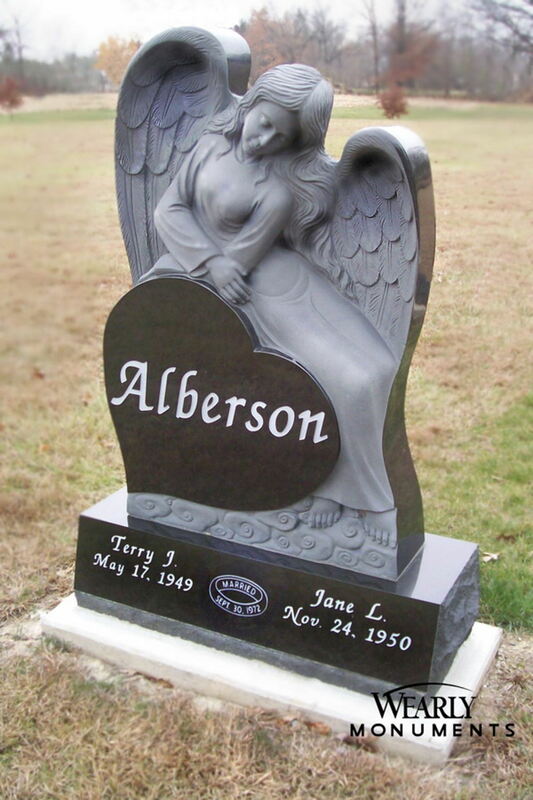 There has been a rising popularity in angel style memorials. 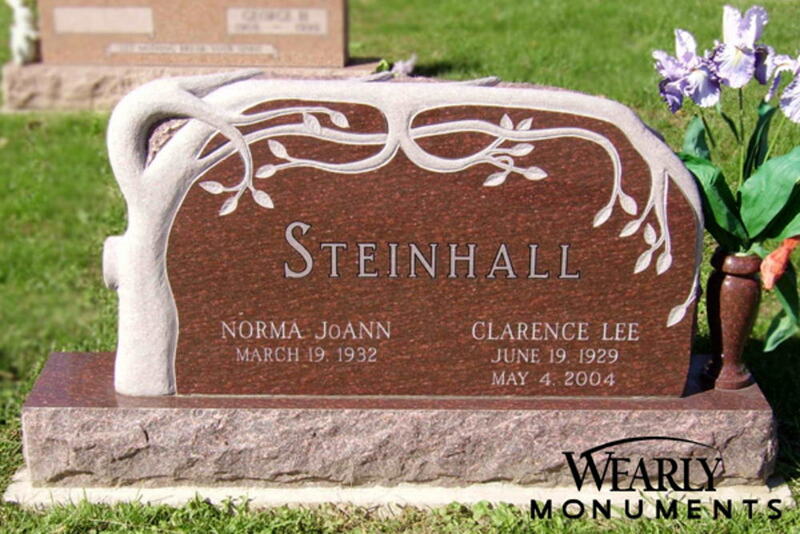 The Alberson memorial is a fine example of Wearly Monuments' treatment of this style. 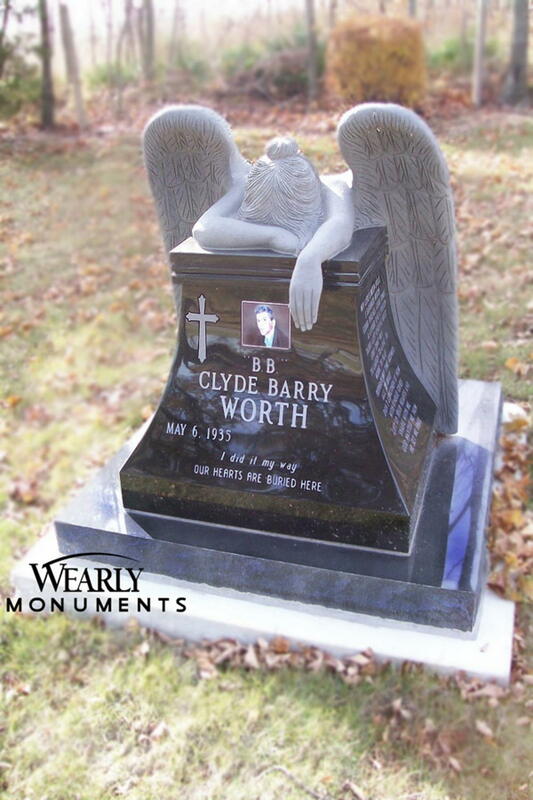 Simple, clean and reflective, the sculptured angel watches over this grave site. 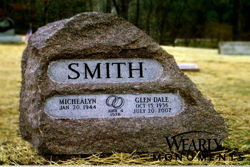 Jet Black granite cut as tear drop with portrait etching. 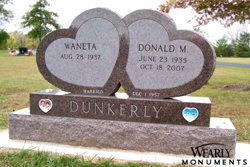 Imperial Gray granite double hearts with sculptured angel and roses. Dakota Mahogany granite “havens” shape. 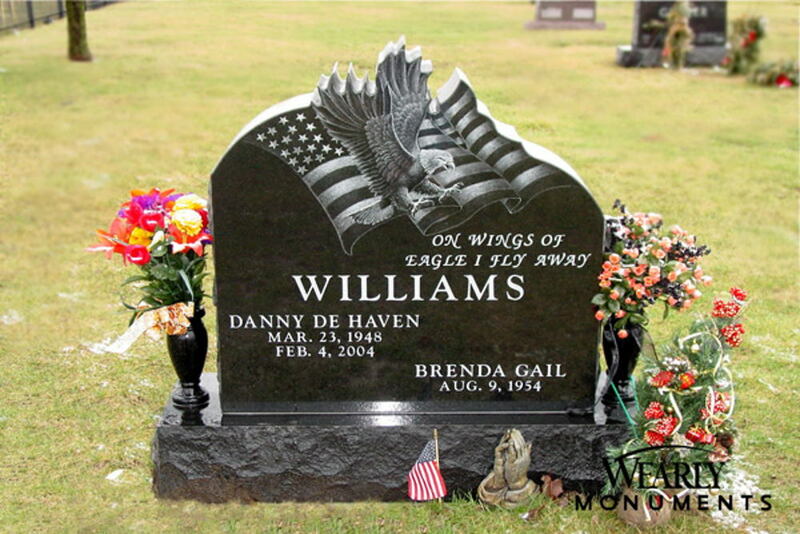 This is a nice option for a double memorial that fits on a single space. 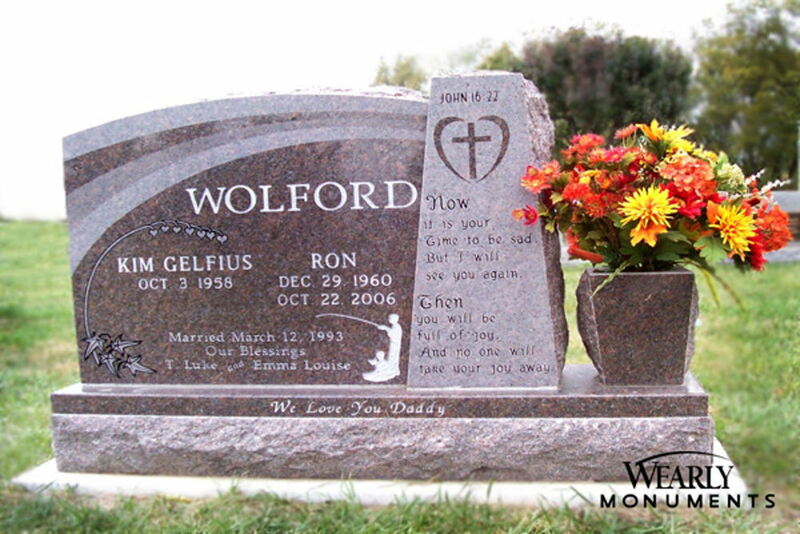 All polished Jet Black screen style memorial with hand etching. Jet Black granite with irregular rock pitched area surrounding hand etched dear. The combination of textural surfaces on the Collins memorial is a very interesting feature. 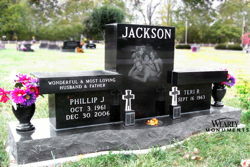 Jet Black granite cut as a saw blade and India Gray granite sculpted as a log. 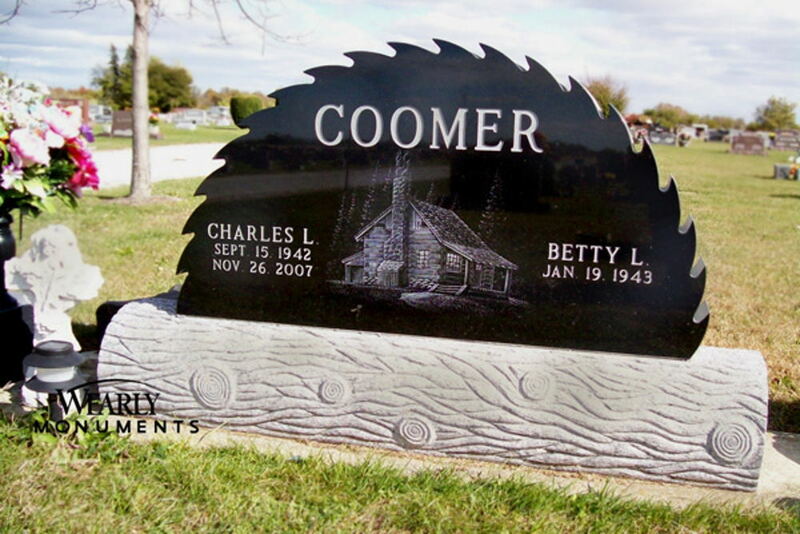 The Coomer memorial is a great example of what happens when staff listens to a client. The Coomer family owned a sawmill. The sales staff knew this was important to the family and presented this idea. It was a perfect fit. All polished Jet Black granite with hand etched globe suspended in the center. 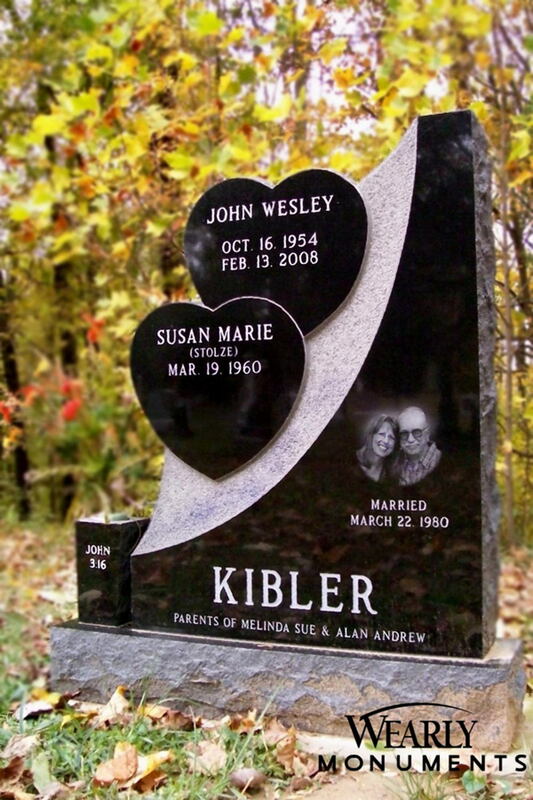 This is a highly personalized memorial representing the deceased’s heart for mission work. The globe has red stars indicating her travels prior to her untimely death. All polished Jet Black granite contemporary shape with hand etching. 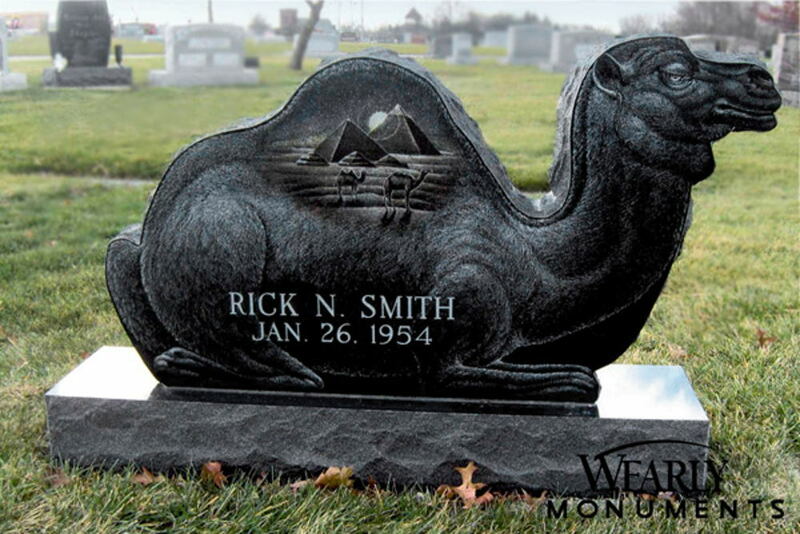 It is difficult to photograph Jet Black granite due to its highly reflective surface. The Dilley memorial is a beautiful example of Wearly Monuments' hand etching. 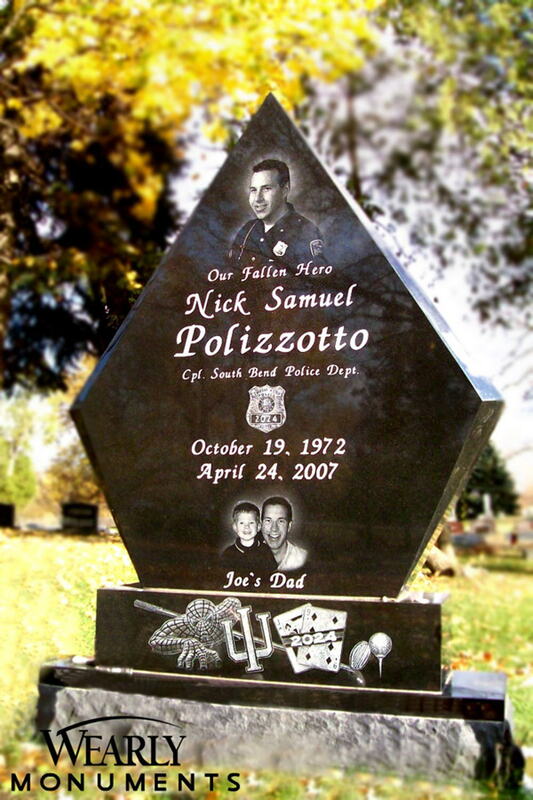 If you were standing in front of this stone, you could almost hear the whistle blowing. 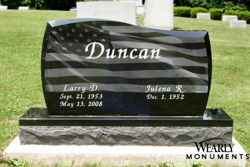 All polished Jet Black granite with facets and laser etched flag. While we generally prefer hand etching over laser etching, we do have a facility to do laser etched work. The US flag is one example of laser etching at its best. 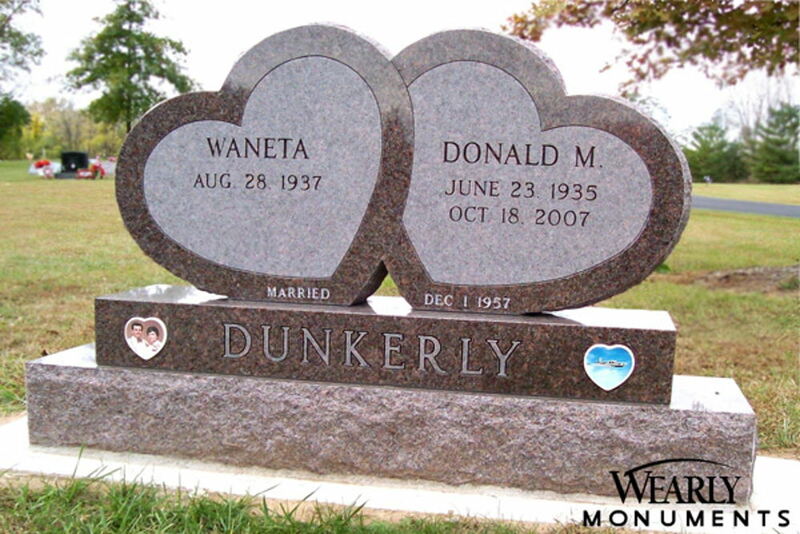 Dakota Mahogany granite cut as double leaning hearts. 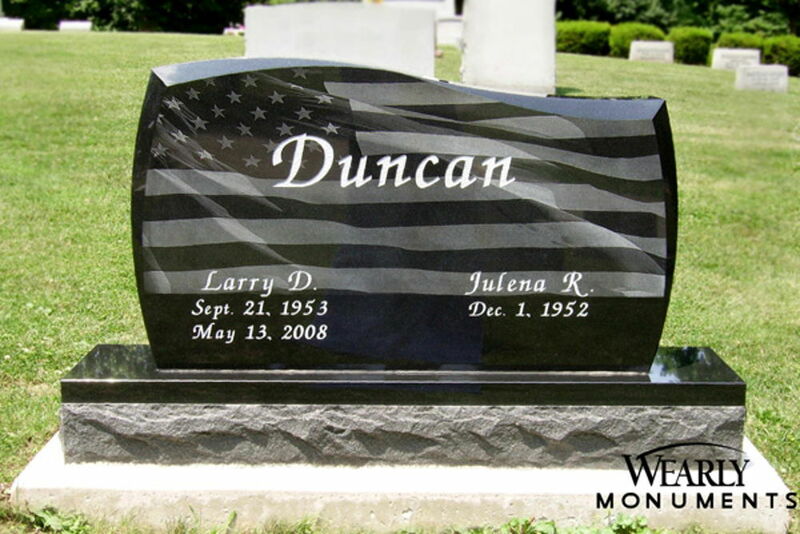 This memorial is a good example of the contrast between polished and steeled surfaces. The plinth or sub-base is all polished with frosted outline lettering while the hearts are mostly frosted on the surface. 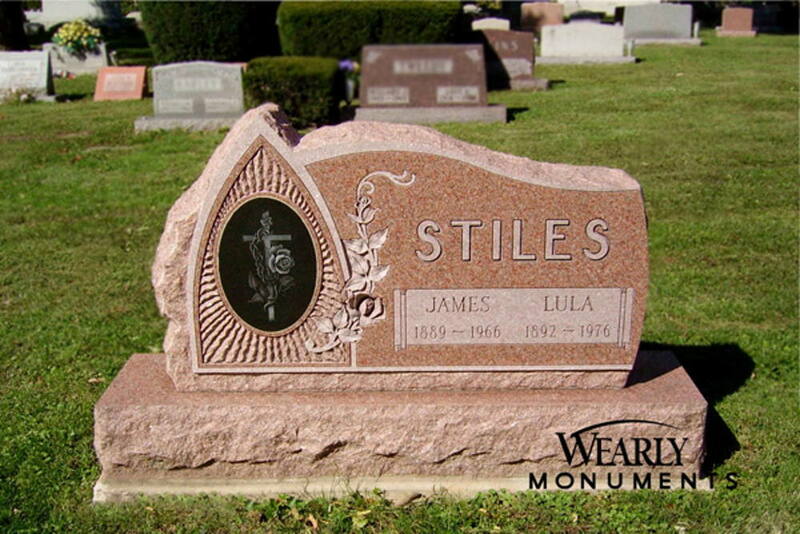 All polished Jet Black granite with hand etched portrait. 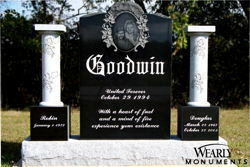 Jet Black center die and blocks with steeled Vermont Gray turned columns, deep sculpted roses, and hand etched portrait. 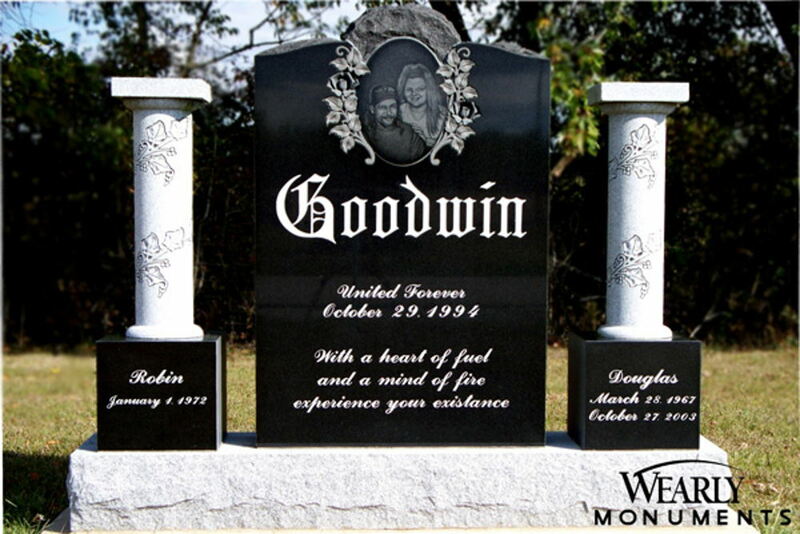 The Goodwin memorial puts a contemporary spin on a classic traditional monument. The script style lettering is not one we would typically recommend. However, it seems to work well on this memorial. 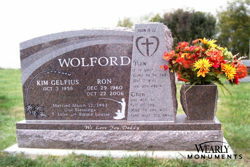 Salisbury Pink granite with wild rose carving. 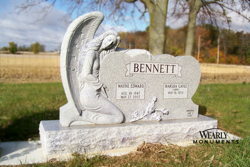 All polished India Blue granite with sculptured angel in front of hammered surface. The detailing in this angel is exquisite. 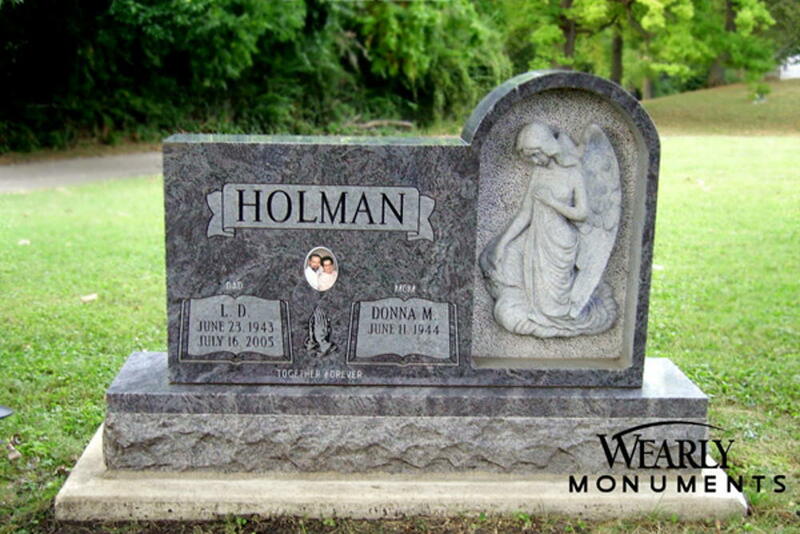 The Holman memorial is a nice combination of contemporary and classic form. 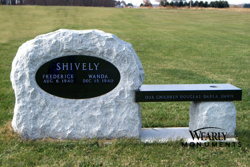 All polished Jet Black bench with hand etched family portrait and granite vases. 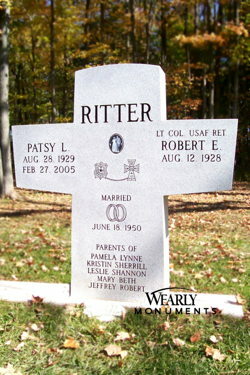 This is another nice example of combining a bench memorial with an upright tablet. 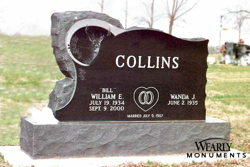 Jet Black granite "stacked hearts" with scooped and hammered surface treatment, granite vase, and laser etched portrait. The Kibler memorial is a very contemporary configuration of the double heart idea. the balance is very nice on this memorial and the contrast between polished and hammered surface is a little unexpected. 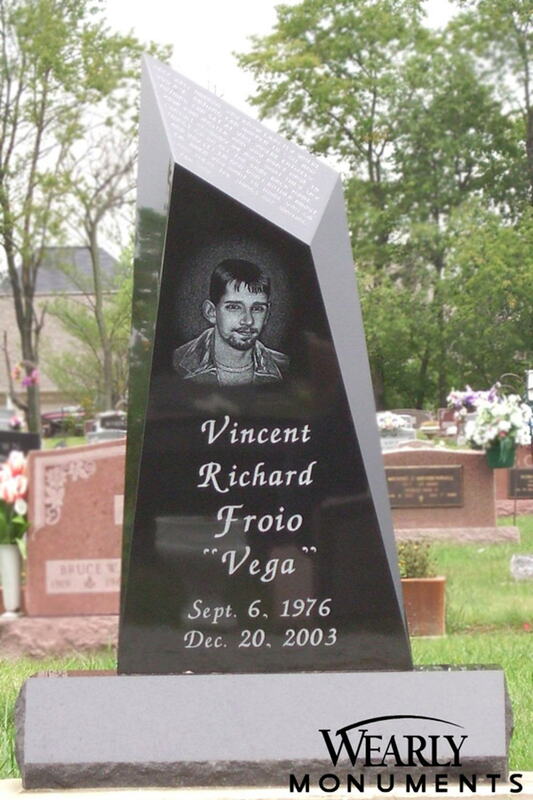 All polished Jet Black Granite with portrait etching. 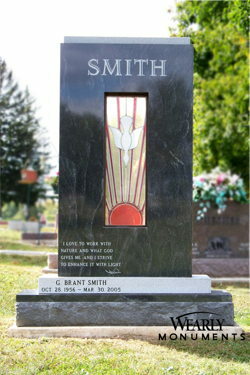 This memorial has been personalized with several etchings representing life interests of the deceased. India Blue granite with flamed surface and polished inset. 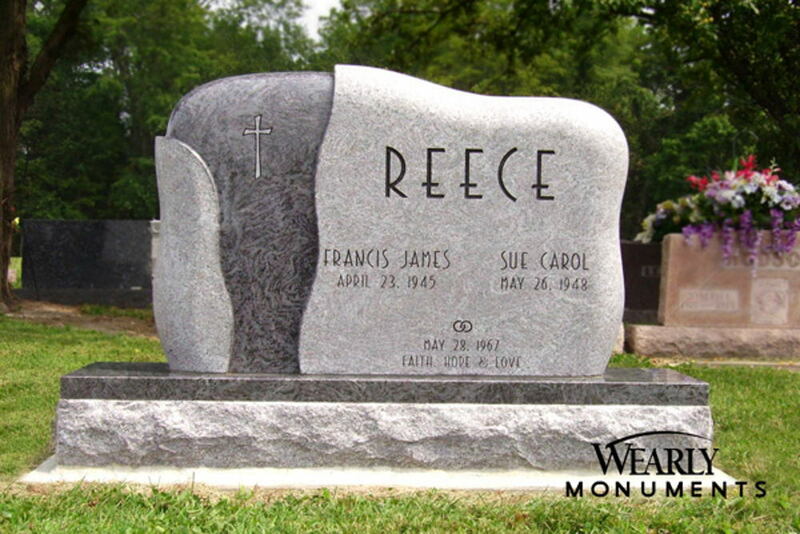 The only hard line on the Reece memorial is the top of the base stone. This is a very organic and soft form. One normally does not think “soft” when referencing granite, but this memorial is very flowing in its form. 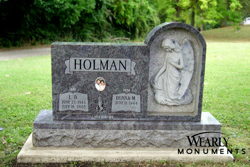 All steeled Vermont Gray granite cut in shape of modern cross with recessed porcelain picture. India Gray granite with Jet Black oval inlay and bench seat. The pedestal and seat are cored for a flower vase. The Shively memorial conjures a feeling of natural boulder with the irregular rock pitched surface and the fact it is more than a foot thick. Dakota Mahogany boulder style memorial. This is a great option for a naturalist. 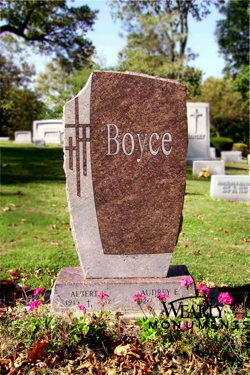 The “Back to Nature” boulders are all rock finish with areas for lettering tooled down. There are no two alike, although you may select from a variety of approximate shapes. 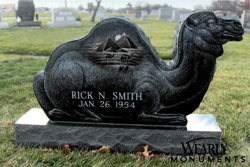 Jet Black granite contured and etched in shape of camel. The Smith memorial is a great example of the detail that can be achieved with hand etching. This is truly a unique memorial and one we hope will inspire you to discuss your personal interests with one of our staff. All polished Ebony Mist granite with stained glass insert. This is a fairly uncommon combination of materials but one that works very well in this case. The Smith memorial is striking regardless of the season, but there are times when the sun shines through the center glass that people stop in their tracks at the sight. 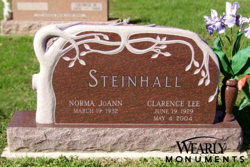 Cat's Eye Red granite with sculpted tree. 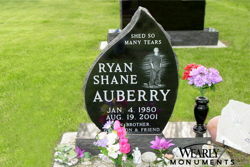 Mountain Rose granite with hand cut starburst and deep sculpted rose surrounding Jet Black hand etched inlay. The Stiles memorial is a wonderful example of how dramatic it can be to combine materials and textures. India Red granite with Hammered finish in concave center paired with raised polished oval and facets. 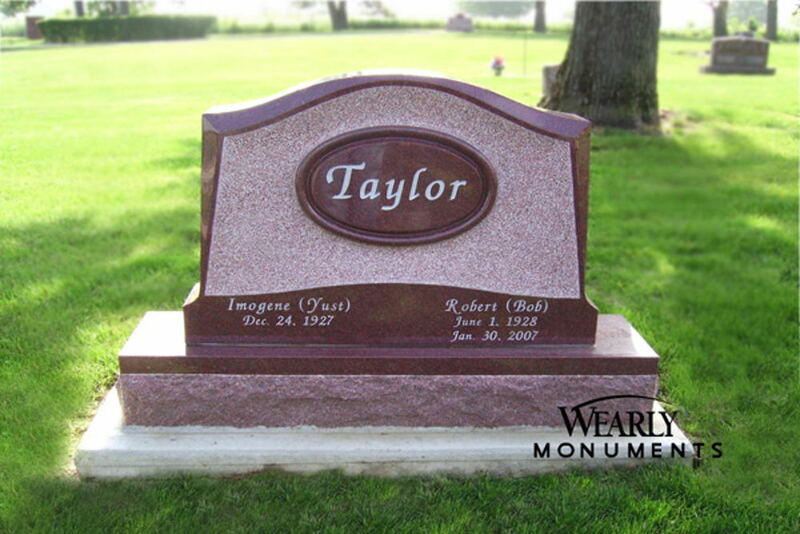 The Taylor memorial is very elegant and understated. 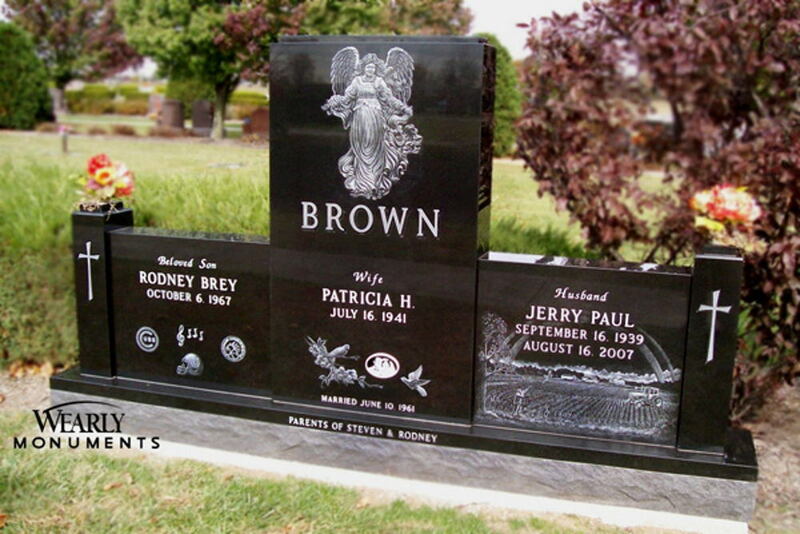 All polished Cat’s Eye Brown granite. This is a very modern shape – almost sculptural – with facets on two sides, a point reaching up to the heavens. 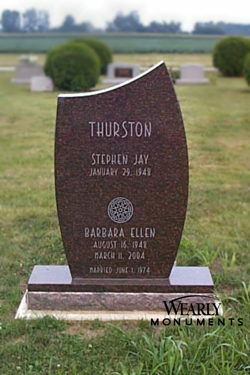 The lettering style on the Thurston memorial works very well with the stone shape. The only ornamentation on this memorial is a Celtic knot. 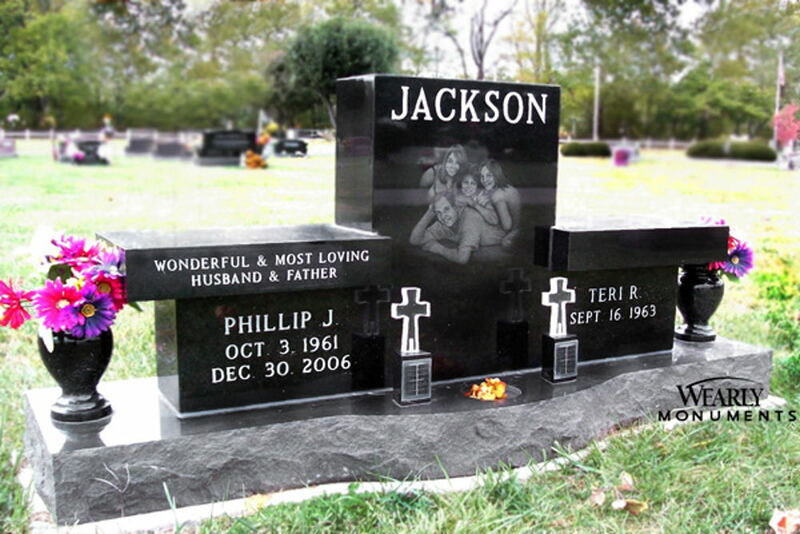 All polished and sculptured Jet Black granite. 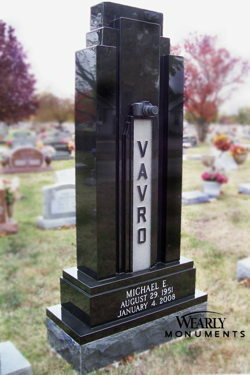 The Vavro memorial obviously represents lifelong interests in architecture and photography. This is another great example of what happens when you sit with a Wearly representative and discuss your ideas. 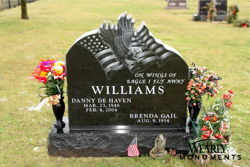 All polished Jet Black granite with wire sawn contour and hand etched flag with eagle. 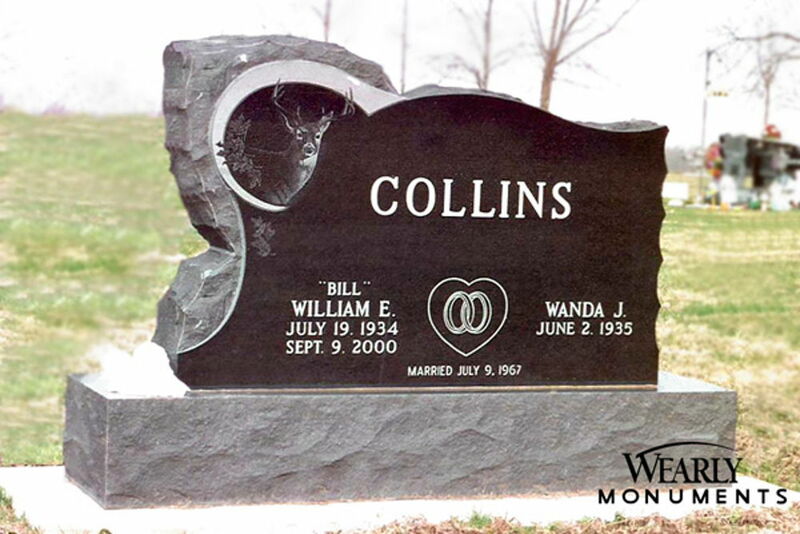 The Williams memorial is a nice example of how etching can add dimension to stone. It is particularly effective with this etching as it follows the contour at the top. Dakota Mahogany granite Oval top with post. The graceful arcing sandblast lines leading to the post with a cross make the Wolford memorial compelling. 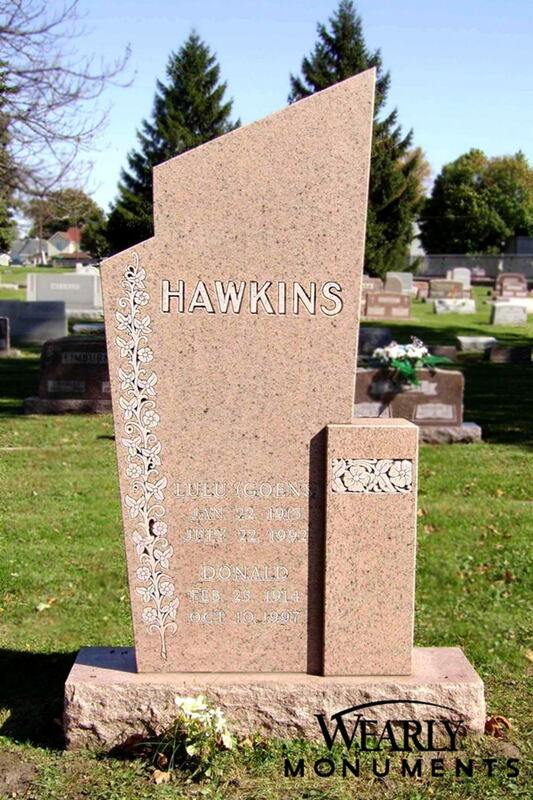 There is a nice contrast of texture in this memorial, accentuated by the granite planter. 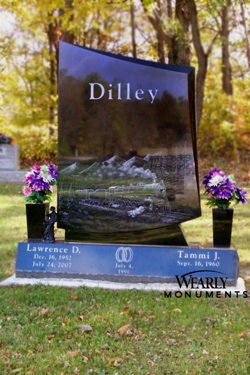 All polished Jet Black granite with sculptured weeping angel and porcelain picture. The Worth memorial is a very quiet and reflective piece.